In the olden days when bespoke fireplaces were introduced, they had one sole purpose— to provide heat. That was what our ancestors were looking for when they had a fireplace installed in their respective homes. Our great grandfathers built fireplaces because they not only needed warmth but also wanted to create a cozy, warm and inviting atmosphere, amidst the cold, bitter season. But over the past few generations, fireplaces evolved into something more than just producing heat, although they haven’t lost their age-old appeal. Modern and bespoke fireplaces still bring cheer and warmth to every home. In fact, they are still a home’s focal point where family members get together and share the warmth of a roaring fire. These days, however, these fireplaces also boast something else—style. Nothing represents a design trend better than a floating hearth. Historically, hearths protected flammable materials such as carpets and wood floors from sparks. They practically served a functional purpose. But such safety measures went the way of the masonry chimney when modern direct-vent gas fireplaces were invented. That is, in terms of pure utility, the hearths of the past became obsolete. It gained in ornamental appeal what it lost in function, however. Just as the fireplace advanced from a mere need into a decorative luxury, so too the hearth’s role as an architectural statement in its own right. Architects, builders and interior designers can easily skip the hearth and create a minimalist and sleek tableau. However, this doesn’t mean that they’ll forgo the appeal that comes with a well-designed bespoke fireplace extension. Do you want to have a hearth that’s inspiring, delighting and awes every single person who sees it, something of an architectural element that not just copies the conventional designs of the past? Well, say hello to the modern floating hearth made by Modus Fireplaces, a contemporary take on a time-honoured tradition. Although it’s not entirely an innovative idea since, historically, builders have placed stonework and brick at various heights, the concept of a hearth above ground has since gained fame in the past few years. 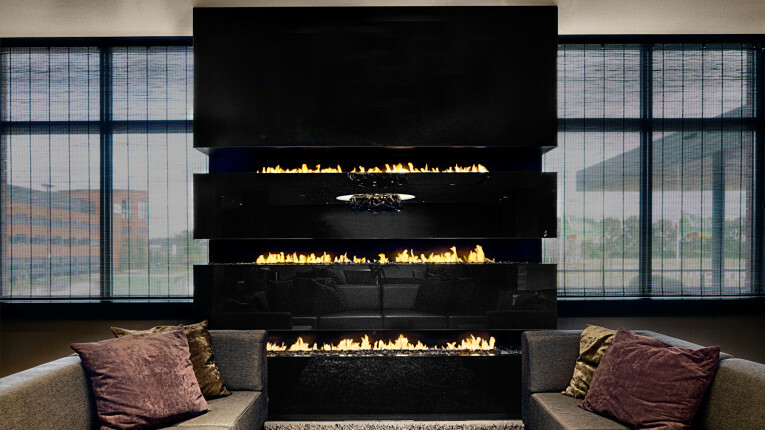 Designers and architects are finding innovative ways that transcend the ordinary bespoke fireplace design. Since any masonry extension could pique the beauty and interest of a fireplace, a floating hearth adds a little bit more spark to the space. When placed above ground but in front of a fireplace, the whole piece will look like it’s floating, creating a sense of gravity-defying lightness. Additionally, you are freed from simply functionality. When it comes to design, placement and materials, the possibilities are endless. If you want a balanced and sturdy feeling, centre the concrete, square slab in front of the fireplace and then position it low to the ground. How about a contemporary look? Pick a thin, long rectangular style, extending further from one side to the next. This offers a more asymmetrical and contemporary look. Modern-day hearths have re-defined function in its own right. They are no longer considered merely just part of the world of plain utility, although it doesn’t mean these contemporary hearths are also just plain ornamental. Instead of being just a safety precaution, they now double as shelves, seats and even ledges. Our forefathers used to tend to the flame all night to ensure that their solitary heat source won’t go up in smoke or worse spread fire on where they’re sleeping. But we no longer do that thanks to the advancement of today’s bespoke fireplaces. Recent generations considered wood-burning fireplaces as a chose, though they had it easier than our ancestors. But contemporary bespoke fireplaces instead burn gas, requiring lesser upkeep, thus lesser worry. All you have to do is turn the flame on and then turn it off once you no longer need it. You have the option of setting the timer and simply watch and enjoy as the magic of modern technology showcases what it is capable of. Enjoying the beauty and warmth of a flame has never been this easier. Propane or Natural Gas – What Better Option for Your Outdoor Contemporary Gas Fires?